Note: Entire contents copyright © 1984 by University of Illinois Press. Only limited, "fair use" excerpts reproduced here. The Book of Mormon explains itself as largely the work of Mormon, a military figure who led his people, the Nephites, from 327 to 385 A.D. in the twilight of their existence as a nation . . .
By any standard the Book of Mormon is a narrative of unusual complexity. Scores of characters like Ether and Moroni, Jared and the brother of Jared, move through the story. The pronunciation guide in the current edition lists 284 proper names: Paanchi, Pachus, Pacumeni, Pagag, Pahoran, Pathros, Pekah, Rahab, Ramath, Rameumpton. Intricate and shattering events are compressed into a few sentences. Migration, war, and intrigue alternate with prophecy, sermon, and conversion. Mormon, as warrior, historian, and prophet himself, interwove political and military events with the history of salvation . . . Besides the intricacy of plot, the narrative perspective is complicated. The first six books are pure source material, written by the original prophets and untouched by later editors. But then with only a slight introduction, Mormon takes up the story himself. In his narrative, derived from the available source materials, he quotes other prophets and sometimes quotes them quoting still others. Moroni injects a letter from his father, and Nephi inserts lengthy passages from previous scriptures. Mormon moves in and out of the narrative, pointing up a crucial conclusion or addressing readers with a sermon of his own. Almost always two minds are present and sometimes three, all kept account of in the flow of words . . .
Alexander Campbell proved his knowledge of the Book of Mormon by summarizing about half of the plot, enough to give his readers a sense of the narrative. Campbell exhibited the customary contempt of Joseph Smith, "as ignorant and as impudent a knave as ever wrote a book," but he saw no need for a committee of authors. Joseph Smith definitely wrote it himself. "There never was a book more evidently written by one set of fingers, nor more certainly conceived in one cranium since the first book appeared in human language, than this same book." "It is as certainly Smith's fabrication as Satan is the father of lies. . . ."
In contrast to the Palmyra critics, Campbell downplayed the similarity to the Bible. What most impressed him was how unbiblical the Book of Mormon was. Partly it was style: "I would as soon compare a bat to the American eagle, a mouse to a mammoth . . . as to contrast it with a single chapter in all the writings of the Jewish or Christian prophets." More striking still was theology. He did not like the fact that Nephi and his brothers exercised the priesthood when they were not descendants of Levi or Aaron, that another land besides Palestine was a promised land, or that descendants of tribes other than Judah became kings. What most appalled him was that the Book of Mormon "represents the christian institution as practised among his Israelites before Jesus was born." The Nephites preached "baptism and other christian usages hundreds of years before Jesus Christ was born!" . . .
As for the intricate plot and the huge array of characters, Campbell dismissed all that as "romance." Subsequent critics had more trouble disregarding what every reader of the book could not help noticing: the Book of Mormon was a complex story. In 1833 the editor of the Painesville Telegraph, E. D. Howe, one of Mormonism's most devoted critics, and an excommunicated Mormon named Philastus Hurlbut teamed up to write an expose' and thought they had stumbled across the answer. While gathering material, Hurlbut learned that some residents of Conneaut, Ohio, saw in the Book of Mormon resemblances to a manuscript written by Solomon Spalding . . . [Hurlbut] and Howe eventually decided that Sidney Rigdon had obtained Spalding's now lost manuscript . . .
. . . Howe and Hurlbut were sure "that there had been, from the beginning of the imposture, a more talented knave behind the curtain. . . ." Sidney Rigdon, a formidable preacher, a colleague of Alexander Campbell's, and a close student of the Bible, was the only one qualified for the task. "If there was a man in the world that could successfully spread and give a name to the vagaries of the Smiths, it was Rigdon." He was "the Iago, the prime mover of the whole conspiracy." (. . . Sidney Rigdon was suspected of complicity in the production of the Book of Mormon by the summer of 1831. James Gordon Bennett, who interviewed people concerning Mormonism in that summer, published this hypothesis in the New York Morning Courier and Enquirer, Aug. 31, 1831, and the Hillsborough (Ohio) Gazette of Oct. 29, 1831, stated that "there is no doubt but the ex-parson from Ohio is the author of the book which was recently printed in Palmyra, and passes for the new Bible." On Bennett, see Leonard J. Arrington, "James Gordon Bennett's 1831 Report on 'The Mormonites,'" B.Y.U. Studies, 10 (Spring, 1970):353-74.) . . . The fact that Howe and Hurlbut contradicted Alexander Campbell was overlooked. Anti-Mormon writers felt no obligation to explain why the learned Bible student Rigdon would make all the elementary theological blunders Campbell identified, or why Rigdon's grammar should be so faulty. The view that Joseph wrote the book out of his own experience was cast aside until the Spalding theory failed and a revival of Campbell's environmentalist hypothesis became necessary once again. Perhaps the most serious failing in all the critiques of the Book of Mormon was an inability to deal with text in any detail. Howe and [p. 128] Hurlbut acknowledged the story by hypothesizing a novelist as co-author but did not discuss the story itself. Campbell referred to the Book of Mormon positions on theological issues but failed to say what they were or how they related to religion of the time . . . Sometime in the early spring of 1830 Joseph Knight came over to Harmony from Colesville, picked up Joseph Smith at his cabin on the Hale property, and drove him to Manchester where the elder Smiths were living with Hyrum. On the way Joseph told Knight "there must be a church formed."
. . . Scott meanwhile was preaching what he called the "restored gospel" in nearby New Lisbon, Ohio, with great success. In the course of a thirty-year ministry he was said to have converted a thousand souls a year. Attracted by similar doctrines, people in Mentor, Ohio, asked Rigdon to preach, and although he refused a salary, they began a house for him. He was preaching in a number of nearby towns when Parley Pratt fell under Rigdon's influence and set out on the fateful mission to New York in the summer of 1830 that brought Pratt into contact with the Book of Mormon. . .
David Whitmer offered the view of one New York Mormon with regard to Rigdon: "Rigdon was a thorough Bible scholar, a man of fine education, and a powerful orator." He had qualities none of them could match, including Joseph. Resentment and jealousy tinged Whitmer's comments. He later observed that Rigdon "soon worked himself deep into Brother Joseph's affections, and had more influence over him than any other man living." Joseph Smith was scarcely twenty-five when he and Emma arrived in Kirtland in early February, 1831. . .
. . . For some like Parley Pratt, Mormonism added an element missing from the Disciples' gospel--divine authority . . . The rapid conversion of Sidney Rigdon and many of his followers in Kirtland suggests that Mormon missionaries taught a familiar Gospel. Judging from later accounts and sermons, Mormons concentrated on the same simple New Testament principles that distinguished Disciple preaching. In 1830 Mormonism probably was closer to the Campbellite and related movements than to any other Christian group . . . Though simple, the effect on audiences was sensational. A prominent Presbyterian in New Lisbon who happened into a meeting and caught the end of Scott's sermon immediately presented himself for baptism. Scores of baptisms followed, and the revival spread. Sidney Rigdon visited Scott in March, 1828, and adopted Scott's method with similar results. . . The simple principles most emphasized by Scott -- faith, repentance, and baptism for the remission of sins -- resembled closely the teaching of the Mormon missionaries, but they had a different significance for the Disciples. Walter Scott considered them to be a breathtaking discovery because he and the Campbells were struggling to free themselves from Calvinistic evangelism [in which] . . . before a person could have confidence in the remission of his sins and even gain admission to the church, he or she must relate such an experience. The Campbells objected to this strenuous psychological ordeal and tried to reduce conversion to a simple order. Walter Scott relied on the sermon of Peter in Acts 2:38 for this "plan of salvation." There the scripture said that repentant believers were to be baptized for remission of sins. Rather than pass through an experience, Christians needed only to believe in Christ, repent, and be baptized . 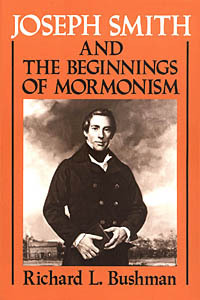 . .
Sidney Rigdon and the members of his congregations in Kirtland and Hiram were not required to abandon any of their basic principles to accept Mormonism, but while the teachings were the same, the revelations to Joseph Smith showed no signs of the Disciples' struggle against Calvinist evangelism . . .
Disciples would have objected to remission of sins by baptism and by fire, for introducing the Holy Ghost implied the necessity of an experience. The Mormons were less sensitive to that implication simply because they were less preoccupied with revivalist conversion. The point where the two groups did converge was best described by the Disciples' phrase, "the restoration of the Ancient Order of Things." Both groups believed in an apostasy from Christianity, necessitating a restoration of the doctrine and practices of New Testament Christianity. Mormons may have borrowed the word "Restoration," used in this sense, from the Disciples. In the revelations given through 1830 the word "restoration" referred mainly to the restoration of Israel to a knowledge of the ancient covenants and to the favor of the Lord. Later on Mormons used the word to mean the restoration of the Church of the New Testament . . .
. . . Campbellites objected, for example, to the Mormon ordinance of laying on of hands for the gift of the Holy Ghost. The apostles admittedly practiced it, but Campbell thought only the apostles had the authority. Mormons claimed to have apostolic authority and confidently bestowed the Holy Ghost through the laying on of hands. The ethos of Mormonism was epitomized in the enlargement of the Campbellite word "restoration" into the phrase "the restoration of all things."